So ended "worship" at Pointe Church in Fort Wayne Indiana last week. If you are confused, this is a song from the heavy metal band ACDC. 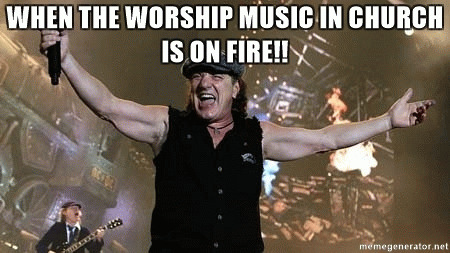 Pastor Ray Harris is not the first to use absurdly carnal music during worship and in fact is not even the first to use ACDC. That dubious honor belongs to disgraced mega church preacher Perry Noble who once had his worship band play Highway to Hell -- on Easter Sunday. As the church slides further and further into apostasy we can expect more displays of human stupidity in the name of Jesus Christ. We have see Hillsong over sexualize Silent Night. We have seen Hillsong also sing "I like to Move It, Move It" during worship. The aforementioned Noble once did Miley Cyrus's Wrecking Ball. Andy Stanley recently did sexual boy band songs from the 1990s. These things no longer result in our outrage because they are simply expected and accepted. When the church no longer honors God why in the world would their worship? To be honest when I first saw this story I was just going to let it pass by with an honorable heretical mention but then I read the story that explained they did this song because of the sermon series Harris was preaching called, "I was broke, but Now I'm Not." A not so clever but certainly disgusting play on words from the I was blind but now I see Bible verse. I have linked the sermon series audio files above so we can reason together and see that Ray Harris was merely using ACDC to promote another financial sheep beating at the hands of a hireling. The first part Harris considers foundational. He needs to establish a false foundation upon which to build his false theology. He does mix some truth as well, which makes the teaching that much more dangerous. He opens with Psalm 24:1 to prove that the Lord owns everything. We will see that Harris has absolutely no clue what this verse or parable is actually about later on but for now he believes this establishes that managing money on behalf of God is a matter of trust. Beloved this is the anatomy of a false teaching. God wants to say things to us through His Word but not like this. What we see here is the worst form of proof texting. To take three different verses spanning the entire four thousand years of Scripture and patch them together to pretend that somehow God was actually laying down financial principles when you tie these three unrelated verses together. That God owns everything, has made us His managers, and that how we manage is a matter of trust. It sounds pious doesn't it? I mean, he used three whole Scriptures! No beloved. Ray Harris has a motive here and that is greed. He proves it by quoting the textbook false claims made by tithing teachers. He claims that 17 of the 38 parables deal with money -- no they do not. He claims that one sixth of the verses in the Gospel accounts deal with money -- no they do not. He says that the Bible as a whole speaks more about money than love, hope and prayer combined -- no it does not. Our wickedly deceitful hearts can see whatever we want to see beloved. Harris will eventually eviscerate the Parable of the Talents because he thinks it is about money -- but it is not. When your greedy heart is concerned about money you can see it everywhere. Harris closes the first lesson with the old standby for tithing hucksters. The Prophet Malachi. Perhaps no book is most abused than Malachi. Harris claims the same tired old false teachings here. That the storehouse is somehow the local church. It is not. It was literally referring to the storehouse where the tithe was kept for distribution to the Levites. You should really do a study one time on Malachi beloved because it is fascinating. You will need to also read Nehemiah, as Malachi was a prophet during the story of Nehemiah and the robbery that was going on in Malachi 3 is explained in Nehemiah 13. You see the Book of Malachi is not written to the church today. Heck it was not even written to the people in the days of Malachi! It was written to the priests because they were robbing God! Not the people. The bottom line here is tithing was part of the civil law of Israel and according to Galatians 5 if you insist on adhering to any part of the law then you actually sever yourself from Christ and He is useless to you! You want to talk about unconscionable sheep beating! It was taught here that if you are living on welfare, you earn about nine thousand dollars per year in benefits and that places you in the top 17% of money makers on the planet so this verse is written to you! Wow. Where do we start? How about that the nine thousand is not in money! Most of it is the form of subsidies to assist people from becoming homeless. The maximum cash award in New York City for example is less than $140 per month. How about the fact that you are comparing apples and orangutans? When you compare the entire world you lose the context of cost of living. This was just a disgusting way to try and loop even the poorest in Fort Wayne, which has a 19% poverty rate, into the tithing equation.